A great variety of guidelines and regulations apply to mounting systems. But which ones actually make sense? Which ones have stood the test of time? Here come the answers. The load reserves of flat roofs are often quite limited. This must be taken into account when planning solar power installations. To provide orientation, testing and certification institutes, the Central Association of the German Roofing Trade (ZVDH) and the European Committee for Standardisation have published various guidelines and regulations in order to prevent damage to the supporting structures, roofing and insulation. The ten Eurocodes issued by the European Committee for Standardisation are uniform European-wide regulations covering the planning and calculation of all structures in the construction industry. They regulate, for example, how to avoid unforeseen changes (e.g. due to a storm) and changes in the load-bearing structure caused by various influences. For example, the codes define the fundamentals of structural design and specify how reinforced concrete, pre-stressed concrete, timber and masonry structures should be built. The assembly systems of the Ernst Schweizer AG are designed according to Eurocode 0 (Basics of Structural Design), EC 1 (General Effects on Structures, Snow and Wind Loads) and EC 9 (Dimensioning of Aluminium Structures). The specific pressure coefficients (so-called cp coefficients) for the flat roof mounting systems in the MSP series were established experimentally in a wind tunnel. These values can be used to calculate the effective pressure or suction on each individual solar panel all the way to the edge of the roof. The tests were carried out in accordance with the guidelines of the Wind Technological Society (WTG) in their Border Layer Wind Tunnel. The researchers determined the pressure coefficients for a wide variety of configurations and inflow directions. For additional safety, the Swiss company ensures that different attic heights are taken into account in the measurements. With the detailed results, the manufacturers can identify how the forces in their aerodynamic flat roof systems act and are distributed across the panel array and the roof. The Ernst Schweizer AG has integrated all these analyses in its free design software proMSP, which can map the local forces in detail and determine an optimised ballast distribution. The correct ballasting is not only determined by the cp coefficient, but also by the coefficient of static friction. The higher the static friction, the harder it is to set a body in motion from a position of rest by a horizontal force acting on it. 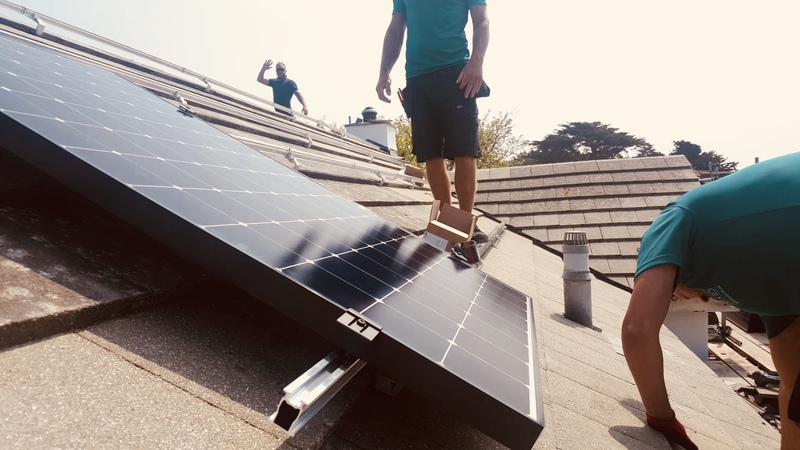 In order to prevent the solar installation from shifting, planners must therefore also take the coefficient of static friction between the solar installation and the roof into account when ballasting. This value depends, among other things, on the building materials used and the condition of the surface (i.e. rough, smooth, wet, dry). The static friction between the base plate (pressure distribution) and the fleece (building protection) of the installation system must always be higher than between the fleece and the roof. This is ensured by the structured surfaces in the base plates. In the case of foil roofs, the German Solar Industry Association (BSW-Solar) recommends the use of static friction coefficients of 0.2 for nonwovens and 0.5 for rubber-based and aluminium-laminated building protection mats. For bitumen roofs, however, 0.6 should be used as static friction coefficients for fleece and rubber-based building protection mats and 0.2 for aluminium-laminated building protection mats, according to BSW-Solar. The Ernst Schweizer AG calculates based on the values determined in their experiments and uses overly cautious parameters in uncertain cases. Competitors sometimes use a general coefficient of 0.5 or 0.6, leaving the customer to do the testing. The Swiss engineers tested the friction combinations of their substructures including fleece and roofing membrane. They carried out ten measurements each in dry and wet weather and statistically evaluated the results in accordance with the design specifications of Eurocode 0. They have integrated the results into the extensive database of the proMSP software. If the Swiss manufacturers are unfamiliar with the roofing membrane, they either add an additional safety factor to the design or determine the coefficient of friction on site using a measuring device. These tests are also carried out under various conditions. The Ernst Schweizer systems meet the requirements of the Flat Roof Directive issued by the Central Association of the German Roofing Trade in 2016. The directive regulates how roofs are to be waterproofed. For example, it lists which compressive stresses different insulating materials can absorb. According to this information, insulation materials should not be compressed by more than two percent over a longer period of time in order to avoid permanent deformation. This also includes the impact of a photovoltaic system. This is taken into account in the structural calculation. Dr Helge Hartwig is Head of Sales and Technology for PV mounting systems at Ernst Schweizer AG.